"The hardest challenge to the digital author is to create a book that is not out of date by the time the ink is dry. Steve Johnson has broken through this barrier, creating the first book that address digital photography as a complete process, from digital's earliest beginnings, through today's technology knothole and ethical impact on our world. 12 on a scale of 10." "...Stephen elegantly guides the reader through the complexities involved in color management while reminding us all that photography is art and no collection of techniques and tools should distract us from the joy and fun of that creative endeavor." "In this long-overdue book, Steve shares more than a decade of experience at the forefront of photography's evolution from silver to silicon, explaining the new technology, tools and techniques in straightforward language that every photo enthusiast will find both fascinating and enlightening." -Mike Collette, President, Better Light, Inc.
"Stephen Johnson is a name well-known in the world of digital photography. The Pacifica resident and business owner travels the world to offer seminars and lectures on digital photography. His own digital landscape photography is recognized throughout the world for its amazing quality and innovation. He also is gradually turning his Pacifica workshop and gallery in the Pacifica Center for the Arts into an internationally known digital photography center, complete with courses, presentations and exhibits. 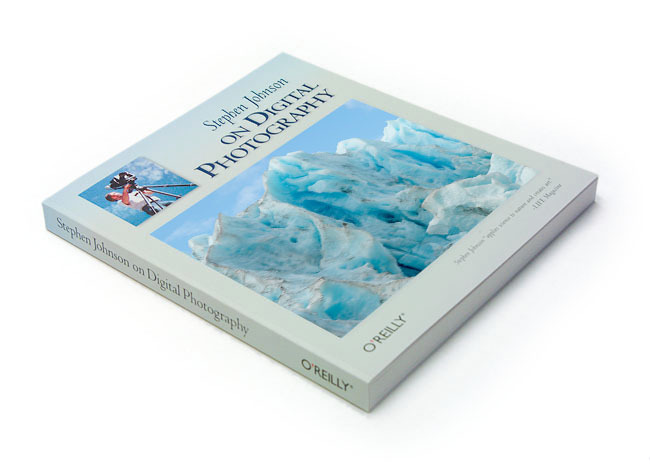 Johnson's new book 'Stephen Johnson on Digital Photography' is a comprehensive volume that combines plenty of how-to advice with Johnson's aesthetic philosophy about photography, the new book is a must for anyone using a digital camera. And that probably includes you, doesn't it? "We're really in the Stone Age of digital photography," Johnson says. "We want it to be more like our visual experience. We're asking photography to be more than our eyes, to hold a moment frozen in time." An expert on almost all things involving a computer and a camera, Johnson was not interested in writing a book on computer software. Instead, he chose to synthesize his vast knowledge about things ranging from Photoshop to the history of photography in a single compendium. It will undoubtedly become a staple of college photography classes, but it is also useful for the amateur who just wants to know more about photography in general. That's what he would really like to do; remove the separation between "photography" and "digital photography" so readers recognize that the technology isn't the primary importance. "It's broadly based book on photography," he says. "It's where we are now." The book evolved out of the author's teaching experience, and while it does focus on digital technology, Johnson would like it to have "the potential to take digital photography and make it 'photography.' It's meant to be a more general book." He's hoping that some of his artistic vision will come through as well as his extensive digital expertise. Learning how to use a digital camera only helps if the photographer also has an aesthetic vision that is heightened by that knowledge. "Photographic truth is what makes us love photography so deeply," he says. "Human aspiration takes the technology and does something heartfelt with it," says Johnson, crystallizing in a simple statement what he hopes his new book will help other photographers do." A master photographer and teacher since 1977, Stephen Johnson is widely recognized as a pioneer of digital photography. His new book, Stephen Johnson on Digital Photography, chronicles his ride on the bleeding edge of this medium's evolution, and provides a practical in-depth introduction to digital photography that includes the latest techniques. Complete with beautiful color photographic examples and illustrations, this book is a unique, passionate, holistic examination of photography in the digital era. Having taken several workshops with Steve Johnson, I can heartily recommend his long-awaited book that provides a nice blend of history, personal anecdotes of a pioneer (the fellow with the arrows in his back), perspectives on being an artist, and practical “how-to” advice learned from experience (his and colleagues). an excerpt....There's ample context to lay in around such stories. First, when it comes to the reliability of news photographs and video imagery, doubts date back to photographer Matthew Brady's staging of dead and wounded bodies during the Civil War. Jane Fonda got stripped into a Vietnam War-era protest snap of John Kerry during the 2004 campaign, a stunt not far removed from the supermarket tabloid cover shots of aliens in New York. O.J. Simpson's mug shot was famously darkened and made more sinister on a Time magazine cover. Addressing these and other misdeeds in his new book "Stephen Johnson on Digital Photography," Johnson writes, "The credibility of photographs is in a state of erosion. With digital technology we can synthesize things rather than explore the world." "Stephen Johnson on Digital Photography" brings a wholly unique, passionate, holistic examination (and method for teaching) to the marketplace of resources available to students of photography. With this book, Johnson brings a master's understanding of how any level of "taking pictures" involves a triad of science, craft, and artistic expression. No other book combines the knowledge and background of its author with this breadth of coverage, all in a concise and highly accessible format. At just under 300 pages, "Stephen Johnson on Digital Photography" offers self-learners, students and teachers superb quality and unbeatable value. "Stephen Johnson on Digital Photography" is a terrific book. Magnificent photos. Informative. Creative. Joyful. Well written. Every photographer, amateur or professional will benefit from this work. It is hard task to try to describe the evolutions of digital photography, entwine it with an explanation of the technology, and describe the building of a digital process, but Johnson does it with the same master's touch he brings to his photographic images. Throughout Stephen Johnson's book On Digital Photography, integrity, above all, is examined and stressed. The author's love and respect for art, and photography in particular, are apparent. Anyone reading this book will embrace a much greater grasp of the responsibility of the artist to his audience, himself, and to the artwork. And through that the artist will grow straighter and truer than if he had never thought about these things. If you are even just semi-serious about photography this book is a must read. I know of few who have the depth and experience of Steve, regarding the making of digital photographs. This book has it all. The history, the mechanics, the uses, and the future. With class. With experience. One of Steve's major problems is that he is always a jump ahead of everyone else. Now, you can clearly follow the way he works and importantly, the way he thinks. Frankly I have a sour taste in my mouth for the digital folks, and I must say, they are most fortunate to have Steve as a spokesperson, as most of them can best be described as non practical nerds. Steve has single handedly lifted digital photography from a tasteless illiterate and chaotic splash, to a plane of elegance, shared only by the finest of print making processes. It's about time. It's here. And people like Steve have put it right up there. "A master of the image-making process, Stephen Johnson shows the reader how to develop an "eye" for composing masterful images. Johnson leads the reader through the basics of the digital photography technology and shows how to reproduce images in the highest level of quality. The many photographs, reproduced in both full color and black-and-white, have been printed on high quality glossy paper, making the book an exemplar of the quality that can be achieved using digital tools. This is both a course on the art of image-making and a beautiful coffee table book." "Richly illustrated with examples of Johnson's often revolutionary images, along with informative graphics on everything from the details of image capture on a CCD chip to historical photographs, this rewarding and enlightening book should be on the bookshelf of everyone who is fascinated with all things photographic (digital that is)." Stephen Johnson on Digital Photography is difficult to classify... It may help to think of it as a mix of science, history and art wrapped up with an enthusiasm and excitement that jumps off the page at you....Throughout the book, Johnson's philosophies on photography, imaging and their role in capturing the world about us, are put forward with an intelligence and clarity of vision that is second to none...Highly recommended. The issues that Stephen advances are among the key issues of photography today. These are issues that need a great deal more discussion publicly by a much wider audience and this book is a very fine contribution to advancing that dialog. Consistent with his advocacy of digital straight photography, and his long involvement with environmental issues, Johnson is an advocate of very high definition high dynamic range photography... He really does seem to be able to pull off some amazingly fresh and richly detailed and luminous images. Stephen Johnson on Digital Photography is full of solid information and helpful tips on taking the best pictures with your camera, editing them on your Mac, and presenting them on-screen, on the Web or in print. It is beautifully illustrated, with lots of Stephen’s photographs, as well as some from masters like Ansel Adams. And, unlike so many other computer books, you always get a sense of the author in this book, and Stephen's not afraid to tell you when there is no one answer to a problem. This is a truly fascinating book. Rather than just another How-To book on digital photography, the author takes the reader on a journey through a history of "digital imaging", shows how the same principles of "classic" photography apply to digital photography today, and examines what the future may hold. According to the author, we are still in the stone age of digital photography--we are only now becoming aware of some of the tools that are available. He speculates, "just imagine what the future holds". Digital photography actually has its ancestors in the cathode ray tube, the television, and even radar. Rudimentary sorts of digital cameras were used in the Voyager space programs. In any case, the digital camera you use today owes a great deal to these early ancestors. Understanding this history is important, so that the workings of modern digital cameras is understood. While digital photography does not use a darkroom per se, as in classic photography, a computer running Photoshop can act as a digital darkroom. In this section, the author discusses some of the common techniques used in a "digital darkroom". Interestingly enough, many of these techniques have a direct counterpart in classic photography. It is fascinating to see so many similarities. Finally, there is a very interesting discussion on photo doctoring, ethics, and what the future may hold in this regard for digital photography. In this section, the author shows a doctored photo of President Clinton shaking hands with an alien (courtesy of the Weekly World News), and even more insidious, a doctored photo of John Kerry and Jane Fonda together at an anti-war rally (the photo of John Kerry was taken in 1971; the photo of Jane Fonda in 1972). Through these examples, it becomes clear what a huge moral responsibility photographers shoulder. This was a great book--not only to read about some of the history of photography, but to also see a master at work on his own photographs. This is one of the most insightful, interesting, and educational books I have read on digital photography, or even photography in general. Stephen Johnson on Digtal Photography is the beginning of our digital photography education. There are way to many "Tip's and Tricks" books out there on cute little Photoshop ideas. This book is not one of them! What has been needed for so very long is an start to finish book on digital photography that talks more about the process rather than Photoshop, Stephen's book does that. If you are on the fence about this book, fall over into the pasture and get it, there is even an ethics section on digital photography, long overdue. The real title of this book should have been The Digital Photographer's Bible as it starts with why you should switch to a digital camera as they are changing the photographic world. This image rich book is full of everything a digital photographer needs to know from working with color to archiving of images. The captions are unassuming and clear and make extremely technical information easy to understand. I have known Stephen Johnson for about six years, have studied in his workshops and from time-to-time have have acted as agent in business dealings on his behalf. Of all of his works, this book is one of my personal favorites. I have no stake whatsoever in the success or failure of this book other than wanting the best for Stephen as a fellow photographer. In my opinion this book does for digital photographers what the Ansel Adams series "The Camera", "The Negative" and "The Print" did for traditional film-based photographers. Stephen Johnson is an acknowledged expert in the field, widely regarded as one of the world's premier digital photographers and a pioneer in the art of making exceptional photographs using digital techniques. This book demonstrates also Johnson's ability to share with others what he knows in a down-to-earth and highly readable style. Regardless of what you think you know about digital photography - you need this book! It's a masterpiece. "To put it mildly, I am extremely impressed. The illustrations within the book are great examples of what is possible with digital photography. I started reading the book, front to back, but decided that I could better serve myself by sitting down at the computer and applying the information to some of my photographs. The book is written the way Steve lectures, clearly and concisely." "Reviewing Steve's new book on digital photography is like standing with your camera at the rim of the Grand Canyon...where do you start? His book is a comprehensive and artful blend of the technical history behind the electronic communication technology that led to digital image capture; essential information on digital imaging technology and its benefits without "tech speak"; a compendium of helpful hints for beginning to advanced photographers; a practical guide to the commonly used Photoshop features and their application; the essentials of color space and color management; an introduction to image restoration; grounded advice on composition and creating strong images; his quintessential philosophy on image manipulation; the challenges that face photographers in the digital age; and a finish that leaves the reader with a small piece of his passion for the photographic arts." "This book is destined to be a reference book for anyone serious about digital photography. It creates a step-by-step pathway for anyone to follow leading from "seeing" the image, capturing the image, and on through the entire technical process of realizing the final print. It is written in simple, easy terms and steps. Steve is thought-provoking on some controversial topics, yet gentle in how he presents his style and philosophy behind his vision. Anyone, whether beginner or advanced, in photography can learn something valuable in this work. Those new to digital photography will find this book extremely helpful." "This book is particularly poignant for me since being one of his students in three of his workshops during the past two years. His passion is genuine both in the field and throughout this book. Steve is instrumental in helping me "see" better and this book further reinforces the precepts of a gentle teacher. Stephen Johnson is the father of digital photography. Thanks, Steve. I highly recommend this book." I have worked alongside Steve in Ireland, California and Antarctica and having this book is like having the Master at your side. Steve is the consumate teacher. He has a unique gift of making the complex simple. As a teacher myself, I understand the challenge. In this book, Stephen Johnson takes the reader along on his own personal journey of discovery, dealing with the birth of Digital imaging and the transition from film to silicon in a way that is both history lesson and photoshop primer. The key feature of this book over most others on similar topics is that it is aimed at photographers who are passionate about making beautiful images and not obsessed with the latest filter or gimick. Steve's approach takes you through the process from visualisation to fine print stopping along the way with tips and advice on how to maximise the quality with the minimum of intervention. The book is beautifully written, designed and produced to a standard we have grown to expect from Stephen Johnson. I am making it a mandatory purchase for my Fine Art Media students. As a photographer and teacher for 30 years and working digitally for the last 12 or so, I still could not put this book down. I learnt something from every page. I cannot reccommend it highly enough. This is, quite simply, a gorgeous book. Filled with amazing photos by Stephen Johnson, it provides a wealth of information for photographers of any ability. The book starts with a history of digital photography from the early days to present day. His chapters on Photoshop are second to none, with lots of clear explanations and photos which show exactly what he means. Where other photography manuals fall down by being too technical, or expecting too much background knowledge, Stephen's book actually shows you what the effect of changing this, or tweaking that will do. As a Photoshop manual, it is worth the cover price alone. Coupled with the background to digital photography, it's an absolute bargain. A must for photographers, professional and amateur. I've been reading 'Stephen Johnson on Digital Photography' for the last week, and I think it's a remarkable and essential book. Congratulations! I think the writing is both personable and very clear, and immensely useful. I can't help but think that this book will become a standard textbook for students of digital imaging. This book is a must-have. Stephen Johnson's book is THE book that should be in every photographer's reference library. Personally, I am very surprised that this book is less than 900 pages. However, if you have ever sat through a class conducted by Steve you would understand that he is to-the-point and understands how to teach. As in his classes there is no blather and there is none is this book. He does not want to waste your time or his. He wants you understand the principle behind what he is talking about so you can grow into the photographer that you want to be. This book is more than a book about Photoshop. Much more. He has distilled his experience of film photography, digital photography, print making and even added a chapters on ethics and the future path we must be aware of with all of our work so that we become photographers within our own realm of influence. Steve looks at photography as a part of what we do everyday - represent ourselves as imagers of the world around us. Taking a class with Steve is more than a class about photography or Photoshop. It's a class about our willingness to be aware of how everything interacts with everything else. I often wondered what it would be like to take a photography class with Ansel Adams or Edward Weston. I consider Steve and this book on that same level. Sitting down and digesting this book in several sessions will be just like sitting with one of the masters of photography. It will take several sessions to read this book and understand why you end up feeling like you have been among the giants of the photography world. Readers of Stephen Johnson's "On Digital Photography" get an arm-chair's tour of the birth of digital photography with one of it's pioneers and acknowledged masters. In future years this tome will be regarded as one of the definitive explorations of the transition of the art of photography from film and chemicals to the digital era. As Steve notes, "We are in the Stone Age of digital photography." Steve writes like he teaches - with the intent to explain, enlighten, challenge and encourage further explorations of the subjects under discussion, whether an understanding of the similarities and differences between chemical and digital photography, digital photographic techniques, or the subject of "what is art?" Having taken several studio and field workshops with him, it is terrific to have one volume which encapsulates Steve's nearly two-decade long experience with digital photography. Steve Johnson's incredible digital images are reproduced beautifully and reveal a new way of looking at the natural world. In addition to seeing Johnson's images illustrating ideas, concepts and techniques throughout the book, the reader will be drawn back, time and again, to Chapter 17, "Example Portfolio" where the images are mesmerizing and stories on how the images were created accompany the photographs. If you're looking for the ultimate Photoshop "how-to" book, go find a Bruce Fraser or Scott Kelby book. Many topics that Steve brings up are explored in much greater detail in dedicated volumes, e.g., "Art and Fear" by David Bayles and Ted Orland. But no one else has attempted, much less succeeded, to create a single volume that let's you be present at the birth of digital photography and gain a good understanding of both how digital technology is just one more step in the evolution of technologies deployed by photographers since the birth of photography in 1839 and how many of the issues facing photographers (and buyers/consumers of photography) really haven't changed with the new technology (making art, photography and truth, the empowerment of photography, etc.). This is a book you'll want to read, return to for stimulation (both the ideas and the stunning images), and hold on to as an early record of one pioneer's adventures to successfully become a master in the new world of fine art digital photography. In future years this book will be looked upon as an important historical document about photography, similar to "Stieglitz on Photography, his selected essays and notes," Edward Weston's "Day Books", or Ansel Adams' "Examples: The Making of 40 Photographs." Everything, past, present, and future, and then some on digital photography. This work deals with everything from the basics to what we will encounter in the future in the digital photo world. A great encylopedia offering more knowledge than I need. Well worth it. 'Stephen Johnson on Digital Photography' is a wonderful book for all individuals that are interested in digital photography, or photography in general for that matter. Boasting over 300 pages printed on heavy stock paper, this wonderful book shows examples of digital photos from a true pioneer in the field. With beautiful works of art intermixed with a variety of other historical photos, this guide discusses not only making digital photos but how to edit them using Photoshop. There are lots of digital photography and Photoshop books on the market, but this one really stands out due the overall quality of the author, photos, layout and design. I can easily recommend this to photography afficiandos, you will NOT be disappointed. Stephen Johnson is known as a sourdough pioneer on the frontier of digital photography technology. He's an award winning photographer and has helped chart the course of digital imaging development as a consultant for Apple, Kodak, Epson, and others. "Stephen Johnson on Digital Photography" Takes a unique approach by blending history and anecdotal tales with tips that he has developed over the years. The book speaks in terms of theory and does not get bogged down with the current crop of cameras, printers, and computers. After bringing the reader up to speed by reviewing electronic imaging technology dating back to the mid 19th century, Stephen covers some basic photography skills, speaks about importing and restoring scanned images, color management and fine-art printing, workflow, digital photography in journalism and documentary work, ethics and philosophy of the edited digital image, and speaks about his vision of the future of the medium. Stephen believes that we are in the midst of the biggest renaissance since the birth of photography, and at the same time, are in digital photography's infancy. Where this might not be the best beginner's reference to Photoshop or the use of your new Canon 5D, "Stephen Johnson on Digital Photography" is bound to be a timeless photo-interest book, and may do well as a class text. 285 pages, printed in full-color (except where B&W is being depicted). Steve's Digital Photography Rocks!, As a professional digital photographer who has had the pleasure of watching Stephen Johnson's work evolve through the years, this is one photography book that rocks! In one short tome, Stephen Johnson speaks volumes regarding digital photography as only one of the pioneers of fine art digital photography could. Steve's passionate photography and well written text takes us from his film days to the bleeding-edge present and documents his journey from the break-through "Central Valley Project" book project through the day film died for him to today's cutting edge sensor and printing technology. Not only is this an excellent book on the history of digital, but practical advice to anyone involved with the digital photography process. In few words, this is a must-have for anyone either thinking of making the transition from film to the seasoned pro. Photographs and Text Copyright ©2007, Stephen Johnson. All Rights Reserved.